Cheese ripening, alternatively cheese maturation of affinage, is a process in cheesemaking. It is responsible for the distinct flavour of cheese, and through the modification of "ripening agents", determines the features that define many different varieties of cheeses, such as taste, texture, and body. The process is "characterized by a series of complex physical, chemical and microbiological changes" that incorporates the agents of: "bacteria and enzymes of the milk, lactic culture, rennet, lipases, added moulds or yeasts, and environmental contaminants." The majority of cheese is ripened, save for fresh cheese. Extra aged Beemster cheese, 26+ months old. Note the salt crystals. After the initial manufacturing process of the cheese is done, the cheese ripening process occurs. This process is especially important, since it defines the flavour and texture of the cheese, which differentiates the many varieties. Duration is dependent on the type of cheese and the desired quality, but "three weeks to two or more years" is the general requirement for most cheeses. Ripening is influenced by a variety of factors, ranging from the microflora to the curd, and others. The enzymatic process is the most crucial process for all cheeses, although bacteria plays a role in many varieties. The most important agents in this process include the four following elements: "Rennet, or a substitute for rennet, starter bacteria and associated enzymes, milk enzymes, second starter bacteria and associated enzymes, and non-starter bacteria". 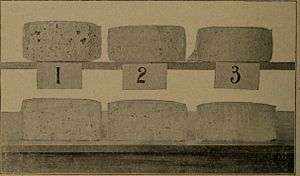 Each of these factors affects the cheese-ripening process differently, and has been the subject of much research. It is important for manufacturers to understand how each of these elements work, so that they are able to maintain the quality of the cheese while producing the cheese at an acceptable investment of time and cost. These agents contribute to the three primary reactions that define cheese ripening: glycolysis, proteolysis, and lipolysis. The process of cheese ripening affects the taste of the final product. If the product is not ripened, the resulting cheese is tasteless, and so, all cheese is ripened except for fresh cheeses. Different factors define taste in cheese, including casein, fat, brine, and many other elements. 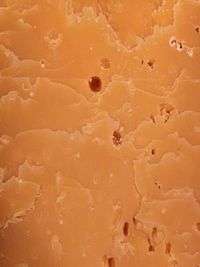 Brine, as an example, mixes with saliva, delivering the flavour of the cheese to the taste buds and determining the cheese's moistness. Many of these elements are specific to the type of cheese. For instance, proline is more abundant in Emmental than in any other type of cheese, and gives the cheese its much sweeter taste. ↑ Decker, John W. (1895). "Cheddar Cheese Making". John W. Decker, B.Agr. (Bachelor of Agriculture), Instructor in Dairying, University of Wisconsin. pp. 53–56. Retrieved 17 November 2015. 1 2 3 4 "Cheese: Cheese Ripening". University of Guelph Department of Dairy Science and Technology. Retrieved 2010-10-23. ↑ "Monitor biochemical changes during cheese ripening with infrared microspectroscopy.". Emerging Food R&D Report. Entrepreneur Magazine. Retrieved 2010-10-23. 1 2 Fox, Patrick. Cogan, Timothy. Guinee, Timothy. Fundamentals of Cheese Science. p. 350. 1 2 Fox, Patrick. Cheese: Chemistry, Physics and Microbiology. p. 389. ↑ Fox, Patrick. Cheese: Chemistry, Physics and Microbiology. p. 390. ↑ Fox, Patrick. Cheese: Chemistry, Physics and Microbiology. p. 392. ↑ Fox, Patrick. Cogan, Timothy. Guinee, Timothy. Fundamentals of Cheese Science. p. 349. ↑ Fox, Patrick. Cheese: Chemistry, Physics and Microbiology. p. 306. ↑ Fox, Patrick. Cheese: Chemistry, Physics and Microbiology. p. 205. ↑ Fox, Patrick. Cogan, Timothy. Guinee, Timothy. Fundamentals of Cheese Science. p. 166. ↑ "Propionibacterium freudenreichii ssp shermanii ATCC9614: A bacterium used in the production of Emmental". Genoscope. 16 January 2008. Retrieved 23 October 2010. ↑ Fox, Patrick. Cheese: Chemistry, Physics and Microbiology. p. 327. ↑ Fox, Patrick. Cheese: Chemistry, Physics and Microbiology. p. 418.